For many early modern authors and printers, a sheet of paper was both a unit of production and a conceptual limit. Now, we often use page length or even word count as a way to describe the limits of a written text. For early moderns, the sheet was the equivalent measure—even though multiple pages might be printed on one sheet of paper. For instance, an author might say he or she had written ‘one sheet’ on a particular subject. Or a printer would calculate the cost of a job by the number of sheets of paper needed. Quarto refers to the format (and implicitly, the size) of a book that results from printing four pages on each side of a sheet of paper, front and back, and folding the sheet twice, each time folding against the long side. Eight pages are thus printed on one sheet of paper. The quarto format was common for early modern printed texts. It was conventional for some small publications, including newsletters and pamphlets, to be complete within one quarto sheet. However, a quarto playbook could require up to a dozen or more sheets of paper to produce. In order to work efficiently, printers often produced pages of text on the sheet out of reading order. The printers had to estimate how much text would fit on all of the pages to be printed on one sheet before printing any of them. Knowing that the folding patterns and formats would eventually produce the correct reading sequence of pages, printers set pages of type in different patterns on the sheet of paper so that they would be in order after folding. These pages might not even be oriented in the same direction. 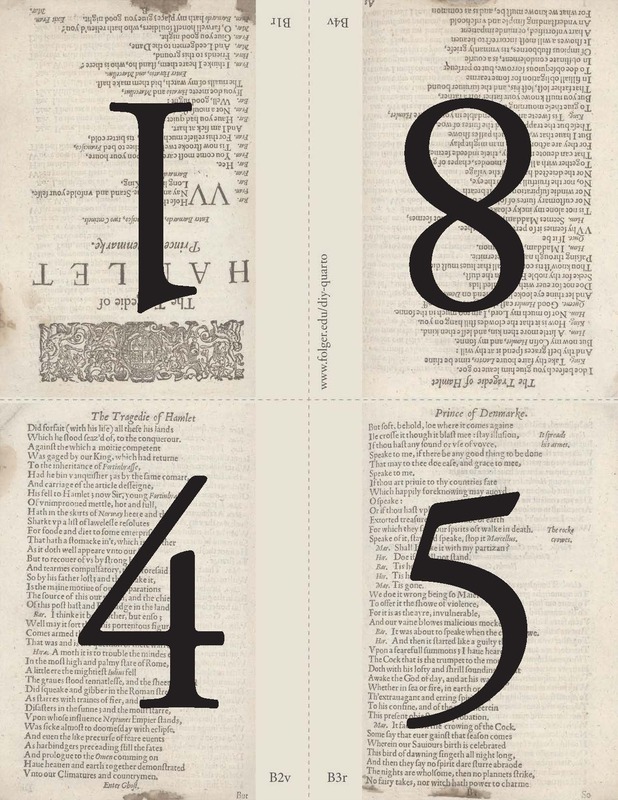 In a quarto format, for instance, pages 1 and 8 were printed next to each other and head-to-head with pages 4 and 5. On the reverse, pages 2,3, 6, and 7 were printed in similar fashion. The reading order of a book emerged only in a later stage of the production process, when sheets would be folded in a certain pattern, and then those folded sheets would be gathered together in a certain order. To keep track of the order, printers labeled each sheet with a letter of the alphabet or other characters. Once edges were cut and trimmed and the book was stitched and possibly bound, this complex process of conceptualization and production was lost to view. Here we introduce you to the working knowledge of early modern printers through interactive exercises and downloadable content. 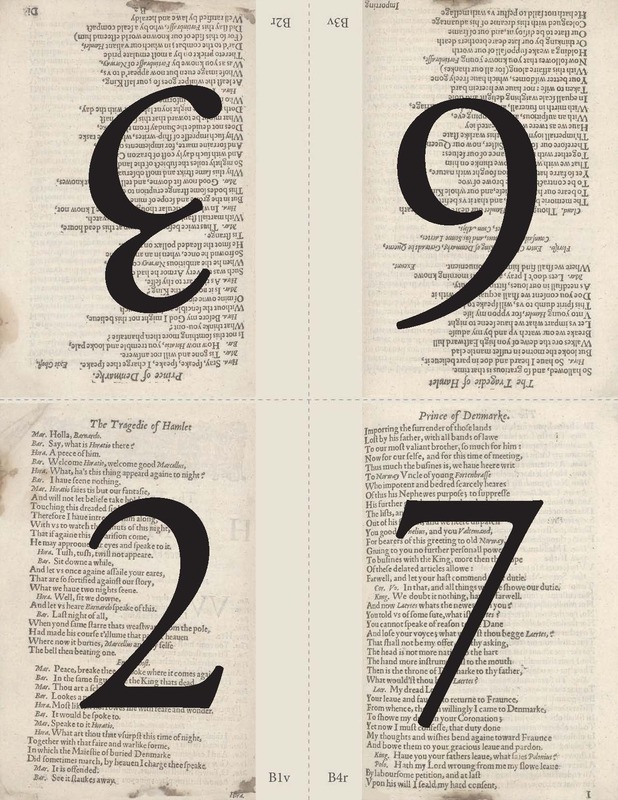 In our virtual printing house, you can make your own quarto edition of Hamlet! Practice making a quarto edition of Hamlet in the virtual printing house. In the virtual printing house, today’s technology sheds light on yesterday’s craftsmanship. But the three dimensionality of the printed sheet may be best experienced by holding and folding some pages. Download and print these high-resolution digital images to make your own paper facsimile of the Folger copy of Q2 Hamlet and two instructional aides. These PDFs are sized for standard 8 ½ by 11 inch paper. The size of a sheet of early modern paper varied, but as a point of reference, the University of Iowa's Center for the Book sizes its handmade paper at 12 x 18. So, at 8 ½ x 11, you will be working at a reduction of approximately 50%. The PDFs are designed to be printed double sided, with ‘flip on short side’ selected. You will want to experiment with your own printer's requirements for double-sided printing for best results. If you want to experiment with something closer to the original size, you might play with “fit to size” printer options on 11 x 14 inch paper. Kastan, David Scott. Shakespeare and the Book. Cambridge University Press, 2001. Pratt, Aaron T., “Stab-Stitching and the status of early English playbooks as literature,” The Library, 7th series, vol. 16 (Sept. 2015), 304-28. Werstine, Paul. “The Textual Mystery of Hamlet.” Shakespeare Quarterly, vol. 39, no. 1, 1988, pp. 1–26. DIY Quarto developed out of conversations among college faculty and Folger staff during the Folger Institute’s 2016–17 micro-grant project, Teaching Shakespeare to Undergraduates, funded by the National Endowment for the Humanities. That project was an outgrowth of the Folger’s national initiative to mark the 400th anniversary of Shakespeare’s death in 2016, The Wonder of Will: 400 Years of Shakespeare. See also DIY First Folio.